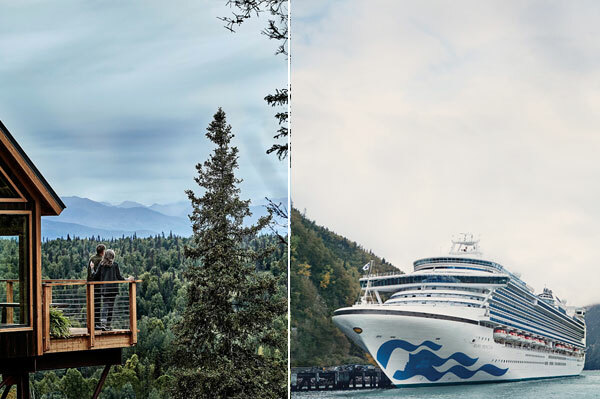 Princess Cruises has welcomed the start of the 2018 Alaska cruise season, offering travellers more options to experience the best of the Great Land. This summer Princess has seven ships sailing the region, including the newly enhanced Golden Princess. While onboard all ships sailing Alaska this year, guests will encounter a variety of ways to engage in unique Alaska experiences through the North to Alaska program, featuring the line’s favourite “Cook My Catch,” an exclusive culinary program allowing guests to return from select Princess fishing excursions to have the chef prepare their very own catch of the day. Also offered, the crowd-favourite Puppies in the Piazza, where real Alaska sled dog puppies are brought onboard in Skagway for guests to interact with. Guests venturing into the interior of Alaska on a Princess cruisetour visiting Mt. McKinley Princess Wilderness Lodge will be some of the first to visit the lodge’s newest addition, a wilderness treehouse built by Pete Nelson of Animal Planet’s hit show “Treehouse Masters.” The treehouse, completed in fall 2017, in conjunction with the line’s Discovery partnership, provides a unique perspective of Denali – the tallest mountain in North America. The treehouse will open its doors to guests looking to take part in unique activities including “Tales from the Sourdough Expedition,” a historic walking tour led by Todd Huston, the first disabled person to break an able-bodied world record in sports by climbing to the highest elevations in each of the 50 United States faster than anyone else. During the walk guests will hear first-hand stories from his journey as well as that of the historic first summit by Pioneer Alaskans in 1910. Guests will also be able to meet with a local Birch tree sap harvesters and enjoy Sappy Hour, a “sweet” look into the process of harvesting this natural product of the boreal forests and products developed from it. In addition to new programming on land, Princess debuts a new dining venue at the line’s Kenai Princess Wilderness Lodge, Rod & Reel. The restaurant renovation is the latest enhancement to the lodge located on the Kenai Peninsula, and will offer new menu items for both lunch and dinner. Guests can also enjoy newly updated Princess-owned rail cars operating on the Alaska railroad, taking travellers between their cruise ship and Princess Wilderness Lodges on the line’s exclusive Direct-to-the-Wilderness rail service, giving them more time to enjoy the Denali-area. The rail journey now features forward facing seats in the upper level dome for all guests, and updated interiors allowing guests to sit back, relax and enjoy the scenery surrounding them. With 130 departures from Seattle, San Francisco, Los Angeles, Vancouver and Whittier featuring unique ports, Princess options abound for exploring Alaska this year. The cruise line offers guests more than 22 cruisetour options, most featuring multiple nights at Princess-owned and operated wilderness lodges to experience the grandeur of Denali. Guests will once again be able to purchase a pre-paid meal package for the land portion of their vacation.